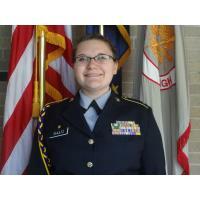 Marion High School JROTC recently completed a promotion board for cadets seeking to advance in the ranks to either sergeant or staff sergeant. At the conclusion, senior Anyssa Shultz was recognized as the best cadet to appear before the board. Shultz stood out in that process, he said. Cadet Shultz is the first to receive such recognition.